Instead of using multiple tools and apps to perform functions related to driving, how about an all-in-one solution? 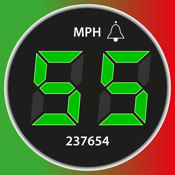 The Speedometer app for your iPod touch, iPad, and iPhone shouldn't be viewed as simply a speedometer; instead, this is a multi-functional tool. With this app you'll be able to track your mileage, receive speed alerts so you don't risk a ticket, use it as a GPS tracker, and even figure out the cost of your driving. If you're looking for an all-in-one solution that's exactly how you can use the Speedometer app. Use this app as your GPS tracker, a speedometer, a tool that can figure out the cost of your trip, and of course use it to track your mileage. You may need the app for work or just your own personal interest; either way, it performs professionally. With just one look at the screen you'll be able to see all your information, everything is well-laid-out with plenty of details. In a glance you'll see your current speed, whether you are under or over the limit (over the limit your speed will appear in red while if you are under the limit it appears in green), view your maximum speed, your average speed, the distance, and plenty more. Last year the app with through some rather extensive updates, bug fixes, enhancements, and a variety of additional tools were added. It's no wonder that the app has then gone on to get a perfect five star rating from users. Users love all the tools, the ease of use, and the fact it can be extremely helpful. The Speedometer app can help you with more than just speed and mileage tracking! It is able to calculate the cost of your trip when you finish. It's got a taximeter that is built-in and lets you charge by the time passed, the kilometer, or mile. This is perfect if you use your car for work. Setting the speed limits is quick and easy since it comes with pre-set limits, just tap on the one you need. There is even a way to mark a location quickly with a note, audio, or a photo. The app is able to work in background mode and you'll still get an audio alert if you go over the speed limit. It's also universal so you can use it on all your devices. The Speedometer app for your iPod touch, iPad, and iPhone gives users a way to track all kinds of details about their trip thanks to the selection of in-depth user-friendly tools.